Mufti passes away after prolonged illness. Will Mehbooba take over? What does this mean for J&K? What are Mehbooba\'s strengths and weaknesses? What is the BJP\'s take? Mufti Mohammad Sayeed passes away after prolonged illness. An assessment of his life and work follows. The biggest political question facing the state now is whether Mehbooba will automatically fill his shoes, what that means for the state and how it will affect the BJP - PDP alliance. Jammu and Kashmir Chief Minister Mufti Mohammad Sayeed has been in the Intensive Care Unit of the All India Institute of Medical Sciences (AIIMS) in Delhi since 24 December. He is said to be "sick, requiring oxygen therapy". A statement issued by the hospital says he is "on antibiotics, anti-fungal drugs and supportive therapy and he is being closely monitored by a team of experts". Read: Meet Mehbooba Mufti, the likely new J&K Chief Minister. Cold sweat, BJP? 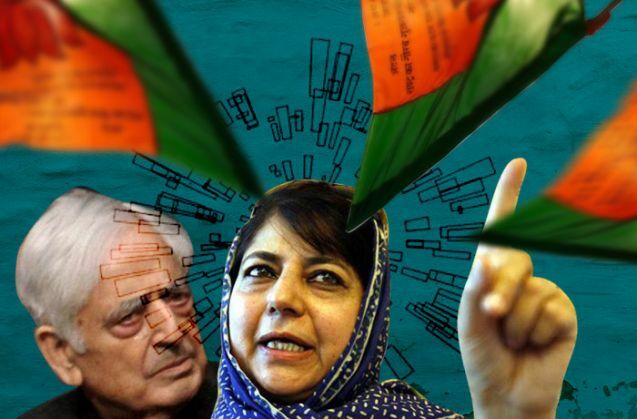 This is the second time since the PDP-BJP coalition assumed power that health problems have prevented Mufti from discharging his responsibilities as CM. He was flown to New Delhi in a state aircraft when he complained of fever and chest pain. PDP president and his daughter Mehbooba Mufti is by his side. In August, Mufti was in Delhi for a series of medical check-ups. And when Mehbooba broke down while speaking about her father's absence, the Valley was agog with speculation. "He is not in the best of health. He has sent his greetings to all of you...Please pray for his long life" she told party workers at Anantnag while struggling to regain her composure. Though Mehbooba later made amends by issuing a statement that Mufti was fine, the damage had been done. Mufti's old age and health suddenly became a matter of public concern. The speculation about his health did not abate even after he returned on 1 September. Mufti, 79, is weighed down by age-related health issues. Few in Jammu and Kashmir believe that Mufti will complete his 6-year term. His ongoing treatment at AIIMS has only caused further uncertainty. A vacuum is being felt in the government, which is further worsened by the harsh winter and the fact that the Darbar has shifted to Jammu. In the summer of 2015, Mufti was in active mode. He visited all the districts of the state except Poonch. He attended all board meetings and made a number of visits outside the state on tourism and horticulture related matters. But by August, the exertion began to take toll on his health. Will Mufti's recurrent health problems precipitate the much anticipated change of guard in the state? The answer may be obvious. But the PDP's alliance partner BJP is yet to warm up to the idea of Mehbooba's takeover. In a recent statement, BJP General Secretary Ram Madhav ruled out an imminent change of guard, saying that Mufti will be Chief Minister for the full term. But PDP, on its part, has only fanned such reports with Mufti himself speaking about Mehbooba's competence. "It's a democratic process. Mehbooba has been working in the field as party president. She has represented an assembly constituency and currently represents a seat in the Lok Sabha, so she deserves this," Mufti said recently when asked by reporters whether his daughter would replace him as the chief minister. But it won't be a smooth transition. Firstly, BJP harbours lingering suspicions about her ideological predilections. Also, within the PDP there are a number of ambitious leaders who would be loath to work under Mehbooba. Already two top leaders - former Deputy Chief Minister Muzaffar Hussain Baig and the former finance minister Tariq Hameed Karra - are in open revolt against the party. Both Baig and Karra are MPs, which has rendered them redundant in the new ruling dispensation in the state. The two leaders have emerged as bitter critics of the government, albeit with different approaches. While Baig speaks about the poor performance of the government, Karra targets the BJP and calls for an end to the alliance. In a hard-hitting attack on the Modi government, Karra said that the rehabilitation package was being denied to J&K because "floods had hit only the Muslim majority Valley". But Mehbooba's popularity among the masses will be too much for them to match. She is credited with transforming the PDP from a tentatively forged political party comprising out-of-work politicians to a formidable mainstream political force. It is because of Mehbooba's efforts that the PDP has come to eclipse the National Conference, which used to have hegemonic dominance over the state's politics. The BJP's reservations about Mehbooba stem from the fact that that she has built her political stock by echoing the narrative of the separatist movement. Even though she may not have expressed the same aims, she has voiced the same grievances such as the human rights excesses that took place in J&K in the 1990s. Mehbooba's politics is very different from her father. She is loud and over-the-top compared to Mufti's quiet and low-key approach. Unlike Mufti, she hasn't succeeded reaching out to Jammu and Ladakh, the other two regions in the state. Mufti is clever and calculating, capable of modifying his politics according to changes in the circumstances. Mehbooba, in contrast, seems to have a more capricious approach to politics. After the Amarnath land row erupted in 2008, she was quick to break the alliance with the Congress that led to the downfall of the Ghulam Nabi Azad government. Though PDP raised its tally from 16 to 21 in the subsequent Assembly elections, Congress stitched an alliance with the NC, thereby keeping PDP away from power. But in the 2014 polls, PDP came back even more stronger, emerging as the single largest party with 28 seats. And like PDP's previous electoral successes, Mehbooba is the driving force behind this victory as well. Should Mufti's illness force him to relinquish the CM's chair, Mehbooba's coronation will depend on the BJP's willingness. In that eventuality, Mehbooba will be faced with a very different challenge - balancing the expectations of New Delhi with those of Kashmir. She will have to ensure that New Delhi trusts her politics even while maintaining her credibility in her core constituency in the Valley. It will be a tough tightrope walk for Mehbooba. TWEET THIS Though popular, Mehbooba is not Mufti. Her politics is loud and she lacks her father's craftiness Mufti passes away after prolonged illness. Will Mehbooba take over? What does this mean for J&K?